The Sixteenth Street Baptist Church Bombing took place on September, 15 1963. 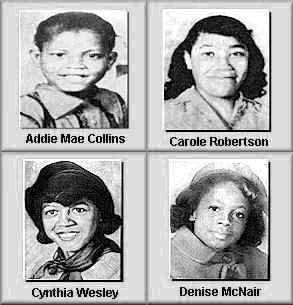 Four young girls, Denise McNair, Cynthia Wesley, Carole Robertson, and Addie Mae Collins, were killed in the racially motivated attack by the Ku Klux Klan against an African American church active in the ongoing civil rights campaign in Birmingham, Alabama. The attack was meant to disrupt black community activists who had been demonstrating for weeks for an end to segregation in the city. It had the opposite effect. Because the four young girls killed were on their way to a basement assembly hall for closing prayers on a Sunday morning, the national public’s anger and revulsion at the slaughter of children at a place of worship helped build support in the John Kennedy administration for civil rights legislation. Twenty-two others were injured, many of them children that had been in the same group as the girls. Sixteenth Street Baptist Church had been a rallying point for civil rights activists throughout the spring and summer leading up to the bombing. The activists had finally reached an agreement with local authorities to begin integrating schools which in turn outraged segregationists and caused the attack. Four men, who were members of the United Klans of America, went to the church and planted 19 sticks of dynamite outside the basement behind the building. The explosion which occurred around 10:20 that Sunday morning destroyed the rear end of the building. The steps going outside were destroyed as were all but one of the church’s stained glass windows. Even the windows of the laundromat across the street were blown out and many cars outside damaged or destroyed. The public funeral for three of the girls attracted over eight thousand people but not one city or state official attended. The Birmingham Post-Herald reported a month later that in the aftermath of the bombing no one had been arrested for the incident itself but 23 African Americans had been arrested for charges ranging from disorderly conduct, to “being drunk and loitering” mostly in the vicinity of the church. One black youth was gunned down by police after he threw rocks at passing cars with white passengers. The four men responsible for the murders were not charged until 45 years later. Two of them, Bobby Frank Cherry and Thomas Blanton are spending the last of their lives in prison, one, Robert Chambliss, already died in prison, and the fourth, Herman Cash, died in the mid-1990s before charges could be brought against him. Birmingham Public Library Digital Collection: http://www.bplonline.org/resources/Digital_Project/SixteenthStBaptistBomb.asp; NPR Forty Years Later, Birmingham Still Struggles with Violent Past, http://www.npr.org/templates/story/story.php?storyId=1431932.